Some weeks ago I got a package with my giveaway that I won some time ago . 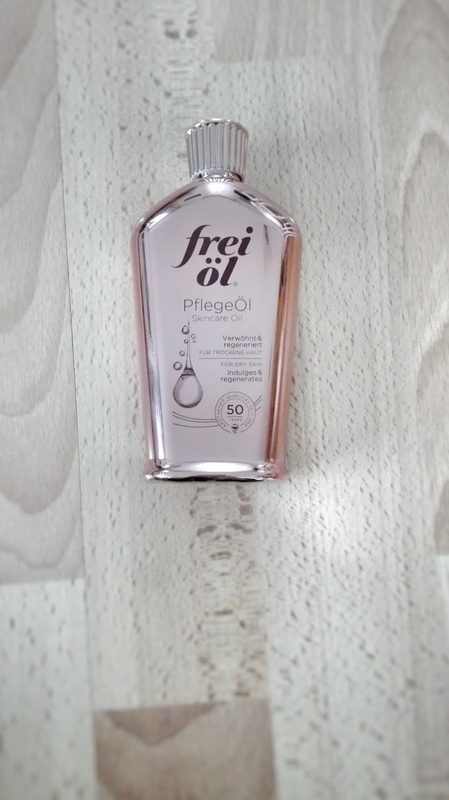 Inside was this caring oil from frei-Öl in the anniversary edition in rose-gold. As I have now tested it for a while and some of my Instagram followers asked me about it, I wanted to give you a little review about it. I am really in love with its colour, doesn´t it look really pretty ? "This silky skincare oil with precious natural oils and vitamins indulges dry skin and is so effective that it even softens scars, stretch marks and uneven skin tones. It lends skin an incomparably smooth and supple feeling." After cleansing you should massage it onto the still moist skin. For scars and similar you should at least use it for 3 months. The oil has a pleasant but not very conspicuous smell. I use it after taking a shower and apply it on my skin, but what I have already found out is, that it is imporant for your skin to be wet. If your skin is not really very wet anymore it takes a long time for the oil until it is absorbed into the skin. So the faster you use it after taking a shower or having a bath the better it is. I do really like the oil and it is already part of my skin care routine ! Do you use bodylotions, body oils, or things like that? 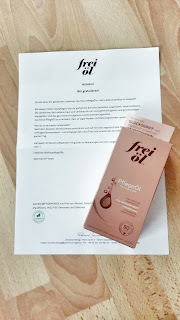 Do you have something from frei-Öl?